At the beginning of each academic year, many NLG student chapters organize “Disorientation” events to introduce the wider student body to the NLG and “people’s lawyering” in general. Whether this event is a quick meet-up of like-minded folks or a full-day event with panel discussions and workshops, it’s a great opportunity to find allies on campus. 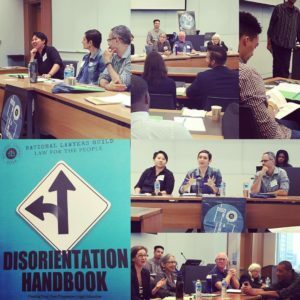 To learn more about organizing Disorientation events, or to order free copies of the Disorientation Handbook, contact Director of Research and Education Traci Yoder at traci@nlg.org. In addition to Disorientation events at law schools, some of our larger NLG Chapters also organize citywide Disorientations for all the law schools in their area. View the full Disorientation Manual below, or read the PDF here!